^ "Everquest price drop". Eurogamer. Archived from the original on 2002-02-19. Retrieved November 14, 2018. ^ "EverQuest: Fifteen Years in Norrath". Sony Online Entertainment. March 14, 2014. Retrieved November 6, 2018. 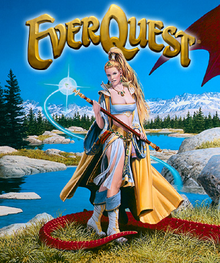 ^ a b "EverQuest® Macintosh Edition Now Available for Mac Gamers". Sony Corporation of America. Archived from the original on September 6, 2015. Retrieved October 27, 2018. ^ Trey Walker (May 1, 2002). "EverQuest II announced". GameSpot. Retrieved March 28, 2015. Sony Online Entertainment has announced EverQuest II, the upcoming sequel to its groundbreaking massively multiplayer online role-playing game EverQuest. ^ "Ubi Soft Entertainment UK". Ubisoft. Archived from the original on 2002-08-08. Retrieved November 14, 2018. ^ Olivetti, Justin (October 18, 2013). "EverQuest Mac shutting down (again)". Engadget. Retrieved November 10, 2018. ^ "Why We Still Play Everquest". USgamer.net. Retrieved 2018-07-21. ^ "Winners of 59th Technology & Engineering Emmy Awards Announced by National Television Academy at Consumer Electronics Show". The National Academy of Television Arts and Sciences (NATAS). Archived from the original on 21 September 2010. Retrieved 12 March 2012. ^ "Everquest's 22nd expansion goes live tomorrow". pcgamer. Retrieved 2018-07-21. ^ a b Bartle, Richard (2003). Designing Virtual Worlds. New Riders Games. ISBN 978-0-13-101816-7. ^ "EverQuest - Massively Multiplayer Online Fantasy Role-Playing Game". Everquest.station.sony.com. Archived from the original on 2011-12-25. Retrieved 2011-12-21. ^ "EverQuest - Classes". Daybreak Game Company. Retrieved November 17, 2018. ^ "Necromancer Spell Reference". Sony Online Entertainment. Archived from the original on 2011-07-16. ^ "SOE Everquest page". Sony. ^ Marks, Robert (2003). Everquest Companion: The Inside Lore of a Gameworld. McGraw-Hill Osborne Media. ISBN 978-0-07-222903-5. ^ "Announcement of Verant Merger". Verant. ^ "Limited Edition Prints". Keith Parkinson Online. Archived from the original on 2015-09-02. Retrieved Sep 10, 2015. ^ Brad McQuaid (1997). "EverQuest -- Graphical MUD". ^ McQuaid, Brad (14 February 2014). "The Inside Story of How a Major MMO Went Wrong" (Interview). Interviewed by Morgan Ramsay. IGN. Retrieved 19 April 2017. ^ "EverQuest Free to Play". Retrieved 2012-02-01. ^ "Everquest Europe joins EverQuest US". TG Daily. Archived from the original on 2012-03-24. Retrieved 2010-06-02. ^ a b "EverQuest for PC Reviews". Metacritic. Retrieved October 1, 2017. ^ Couper, Chris. "EverQuest - Review". AllGame. Archived from the original on December 10, 2014. Retrieved March 21, 2017. ^ a b "EverQuest Review". Computer Games Magazine. 1999. Retrieved October 1, 2017. ^ a b c Amrich, Dan (April 1999). "EverQuest Review for PC". GamePro. Archived from the original on March 13, 2005. Retrieved October 1, 2017. ^ a b Baldric (April 1999). "Everquest - PC Review". Game Revolution. Archived from the original on August 17, 2000. Retrieved October 1, 2017. ^ a b c d Kasavin, Greg (April 2, 1999). "EverQuest Review". Gamespot. Retrieved October 1, 2017. ^ a b c d Blevins, Tal (March 27, 1999). "EverQuest". IGN. Retrieved October 1, 2017. ^ "Everquest Review". PC Gamer (61): 122. June 1999. ^ "GameSpot's The Best & Worst of 1999". GameSpot. Archived from the original on August 18, 2000. Retrieved October 15, 2017. ^ Kasavin, Greg (September 17, 2004). "The Greatest Games of All Time". GameSpot. Archived from the original on 2004-11-15. Retrieved October 15, 2018. ^ "The 100 Best Computer Games of the Millennium". GameSpot UK. Archived from the original on October 10, 2000. Retrieved October 15, 2017. ^ "AIAS - Interactive Achievement Awards". Academy of Interactive Arts and Sciences. Archived from the original on August 15, 2000. Retrieved October 15, 2017. ^ "Best PC Games of 1999". Game Revolution. Archived from the original on March 1, 2000. Retrieved June 11, 2018. ^ "TIME: The Best of 1999: Technology". Time. Archived from the original on August 16, 2000. Retrieved October 15, 2017. ^ "EverQuest Awards". Sony Online Entertainment. Archived from the original on 2001-03-06. Retrieved October 15, 2017. ^ "Winners of 59th Technology & Engineering Emmy Awards Announced by National Television Academy at Consumer Electronics Show". The National Academy of Television Arts and Sciences (NATAS). Archived from the original on February 6, 2009. Retrieved 12 March 2012. ^ "Game Developers Choice Online Awards". Game Developer's Choice Online Archives. Retrieved October 21, 2018. ^ "GameSpot's The Best & Worst of 1999 - Role-Playing Game of the Year, Nominees". GameSpot. Archived from the original on 2000-08-16. Retrieved October 13, 2018. ^ The Gamecenter Staff (January 21, 2000). "The Gamecenter Awards for 1999!". CNET Gamecenter. Archived from the original on June 6, 2000. Retrieved May 31, 2018. ^ "GameSpot's The Best & Worst of 1999 - Best Multiplayer Game". GameSpot. Archived from the original on 2000-08-23. Retrieved October 13, 2018. ^ Parish, Jeremy (August 23, 2012). "1UP's Essential 100, Part Two". 1UP.com. Archived from the original on June 14, 2017. Retrieved October 13, 2018. ^ a b c "Readme: Everquest Milestones". GamersHell.com. Retrieved October 27, 2018. ^ Asher, Mark (April 7, 1999). "Game Spin: On an EverQuest". CNET Gamecenter. Archived from the original on November 18, 2000. ^ Sony Online Entertainment (November 5, 2004). "Satellite Feed - EverQuest II Online Game Hits the Stores". Sony Corporation of America. Archived from the original on September 6, 2015. Retrieved November 6, 2018. ^ Ivory, James D. (2012). Virtual Lives: A Reference Handbook. ABC CLIO, LLC. p. 154. ^ Smith, Andrew (12 February 2001). "Whatever happened to the Everquest auction suit?". Retrieved 29 May 2016. ^ cf. Garlick M., "Player, Pirate or Conducer? A consideration of the rights of online gamers", Yale Journal of Law & Technology, 2004-2005. ^ "EverQuest Lair - Reviews, Platinum, and Cheats". Gameogre.com. Retrieved 2009-03-13. ^ Spain, Judith W.; Vega, Gina (Spring 2005). "EverQuest: Entertainment or Addiction?". The CASE Journal. 1 (2): 60–66. ^ Spain, Judith W.; Vega, Gina (May 2005). "Sony Online Entertainment: EverQuestor EverCrack?". Journal of Business Ethics. 58 (1): 3–6. doi:10.1007/s10551-005-1376-9. ^ a b "Men are from Ogguk. Women are from Kelethin". Nick Yee. Retrieved 2006-09-13. ^ "GU Comics by: Woody Hearn". Gucomics.com. 2004-05-26. Retrieved 2009-03-13. ^ "Counter-Strike e EverQuest estao proibidos no Brasil". UOL. 2008-01-18. Malone, Krista-Lee (2007). "Dragon Kill Points: The Economics of Power Gamers". Games and Culture. doi:10.2139/ssrn.1008035. ISSN 1555-4120. SSRN 1008035.